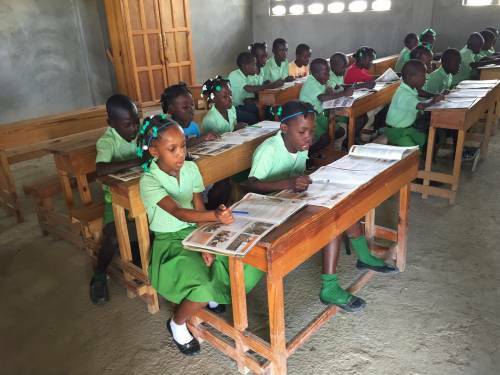 A typical classroom in the EcoVillage school in Haiti. May the joy of Christ’s Resurrection be yours this Easter Sunday. Today, we are reminded of the abundant hope we have in Christ. Resurrection hope points us to the promise of eternal life and calls us to celebrate all circumstances where hopelessness is overcome by God’s grace. A good example of this can be found among our brothers and sisters in Haiti who are thriving in new communities that have sprung up after the devastating 2010 earthquake. In the earthquake’s immediate aftermath, feelings of despair gripped Haiti’s capital of Port-au-Prince and the surrounding region. The ground shook fiercely for less than one minute, but the damage caused in that moment and in the aftershocks that followed displaced more than 1.5 million people. Their homes and possessions were gone, and so were many of their family and friends. The death toll has been estimated at 300,000. However, in Haiti there are many places where hope has been reborn, including the Central Plateau, where thousands of earthquake survivors fled. One Great Hour of Sharing helped survivors who escaped to the Central Plateau build four eco-villages. These communities are designed to be socially, economically and ecologically sustainable. Andral Estes is one of the survivors whose life has been transformed, and he has lent his leadership skills to help others in his eco-village begin again. Estes’ life as a small-scale farmer is a far cry from his previous career in the insurance business. Nevertheless, he has embraced his new circumstances and helped others adjust to a new way of life. He credits his education with giving him the ability to learn how to farm well. Providing education is an important value for Estes and his neighbors. With the help of Presbyterian congregations, they built an elementary school to help future generations develop their God-given talents. Families enjoy the dignity that comes through the livelihoods they have been able to develop. They are especially grateful they can pay school fees for their children and buy uniforms. Your One Great Hour of Sharing gifts helped make this happen. The school was originally built to offer six grades, but recently the community added a seventh-grade classroom. “My dream is to keep expanding it to a high school and even a decent university, so our children don’t have to travel to other cities for an education,” Estes said. To attend high school now, students must walk five miles each way. Estes is grateful for everyone who helped make his community and the school a reality. He said he would like to gather them in one room and thank them. “I want to tell them what they have done for us,” he said. This community shows us that when hope endures, new beginnings emerge. Presbyterian gifts through One Great Hour of Sharing helped kindle the flame of hope in Haiti. As heirs to the promise of Christ’s Resurrection, we strive for a world where hope prevails as we lean into the ultimate hope that Christ gives us. May we celebrate and share that hope today and every day. Transforming God, we give you thanks that lives are renewed through your grace. Strengthened by the power of Resurrection hope, make us instruments of that grace. In the name of the Risen One, we pray. Amen.